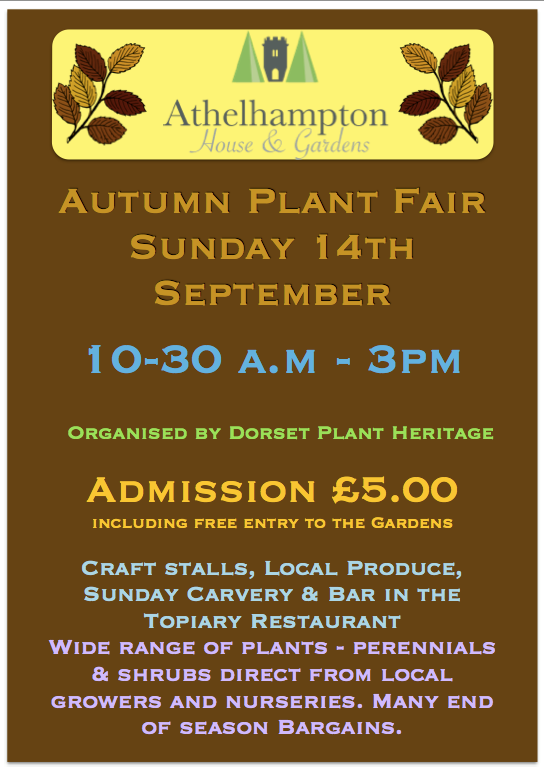 Next Sunday, the 14th Sept, it’s time for our second trip of the year to sell at the plant fair at Athelhampton House. I love this event as the setting is so atmospheric! You have entry to the house and the lovely gardens too. Please note that I am altering my opening times for October. Anyone is still most welcome to visit the Nursery but please PHONE FIRST…01202 695256.. to arrange a time. My A-board will be out if I am working in the garden, so please come in if you want to! Hoping to see you at one of the shows…. HAPPY GARDENING! ← Purbeck Rally & Autojumble Aug 8th,9th &10th.